Although there are many kinds of diesel fuel injectors, common rail injectors are becoming increasingly popular at our shop. They’re more complex and sophisticated than mechanical injectors, and naturally, require a different testing process. A word of caution: due to their complexity, common rail injectors are much less tolerant than older diesel injectors and cannot handle poor quality fuel. Make sure you’re monitoring your fuel quality as you update your equipment. The popular engines in which you’ll find common rail injectors include: GMC/Chevrolet Duramax (since-2001), Dodge/Cummins (since 2003), Ford 6.7 (since 2011), and a variety of Cummins, Volvo, Deutz, Volvo Penta, Mack, Volkswagen, BMW, and Mercedes engines. In fact, pretty much every new engine to the diesel scene has common rail injectors these days. 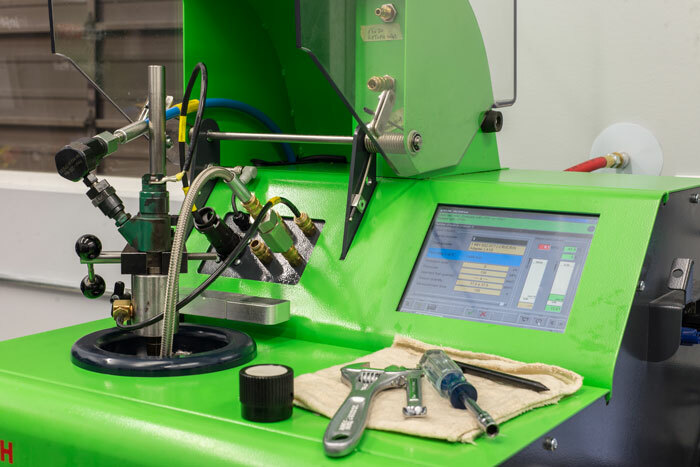 For common rail injectors, we use a computerized test bench to operate your injector in as close to real-world conditions as possible and accurately evaluate injector performance. This bench is the Bosch EPS205, and the first of its kind in Western Canada. While it is the only warranty-approved desktop style test bench for Bosch common rail injectors, it also tests Denso, Delphi, and Siemens injectors. Our tests include high-pressure nozzle and control valve leak testing, injector start behaviour, idle speed adjustment tuning, and full-load quantity. From these tests, we identify which injectors need service or replacement and which are in good condition, meaning you don’t have to spend more money replacing everything. Once your common rail injectors have been tested, you are ready to make an informed decision and often save hundreds of dollars. Proper testing provides accurate evaluations, streamlines diagnostic troubleshooting, and helps get you and your customers back on the road faster! Using equipment authorized by the original equipment manufacturer (OEM), like the Bosch EPS205, to test OEM products provides the most efficient and precise way to examine modern-high-pressure fuel components. Bosch built the injector, and only the Bosch bench can accurately test the injector to the manufacturer’s high expectations. 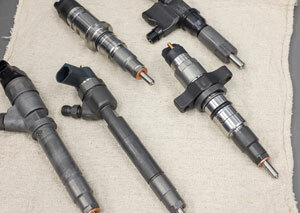 Learn more about Bosch common rail injectors and why we choose to partner with Bosch.